Doctor Jose Alonso | Dr. Jose Alonso | Jose Alonso, M.D. Dr. Jose Alonso graduated from the Columbia University College of Physicians and Surgeons and completed his residency and Chief Residency in Physical Medicine and Rehabilitation at the Columbia Presbyterian Medical Center (CPMC). He then had the privilege of serving for eight years as Medical Director of the Rehabilitation inpatient units as well as being an Assistant Clinical Professor of Rehabilitation Medicine at Columbia. In addition to teaching and learning from residents at CPMC, Dr. Alonso also developed his clinical skills, participated in research in Geriatric Rehab and other areas, worked with hospital administration, and lectured on a local and national level. In 1994 Dr. Alonso became Medical Director of the Rehabilitation Day Hospital and Geriatric Rehabilitation Services at JFK Medical Center. He was also an Assistant Professor of Physical Medicine and Rehabilitation at Robert Wood Johnson Medical School in New Jersey. Once again he furthered his clinical as well as his teaching, research and administrative skills. 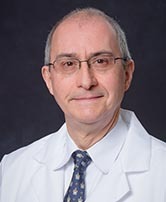 He pursued his interest in the continuum of Rehab services delivery, leading to his next project, becoming Medical Director of Subacute Rehab Services at Genesis in Westfield, New Jersey from 1996 to 2003. Dr. Alonso joined the PM&R Center in April 2003 as our Medical Director of Subacute Rehab Services. He oversees the physiatry services in several facilities. It is Dr. Alonsoï¿½s goal to ensure high quality, multilingual subacute rehabilitation services to help patients to attain their optimal level of functioning. Dr. Alonso aims to address his patients physical, functional, emotional, spiritual, social, vocational and a vocational needs in a holistic approach. Hofer, B.A., Alonso, J.A., Dunn, A.L., Schoenhaus, R., Strax, T.: Day Rehabilitation Programs as Part of the Postacute Continuum. Arch Phys Med Rehabil, 77:969, 1996. Alonso, J.A., Hoffer, B., Schoenhaus, R., Dunn, A., Strax, T.: Day Rehabilitation Programs for Physical Medicine and Rehabilitation: A Nationwide Survey Exploring Present Activities, Interests and Possibilities. Am J Phys Med Rehabil, 75:2, 1996. Pine, Z.M., Miller, D.S., Alonso, J.A. : Atrial Fibrillation Associated with Autonomic Dysreflexia. Am J Phys Med Rehabil, 70:271-273, 1991. Alonso, J.A., Hajdu, M., Gonzalez, E.G., Michelsen, C.B., Semedei, R.: Cortical Somatosensory Evoked Potentials: Effects of Positional Changes. Arch Phys Med Rehabil, 70:194-198, 1989. Alonso, J.A., Hajdu, M., Michelsen, C.B., Gonzalez, E.G. : Normal Variations in Lower Extremity Cortical Somatosensory Evoked Potential Parameters - Effects of Positional Changes, Side of Stimulation, and Height. Arch Phys Med Rehabil, 68:650, 1987. Hajdu, M., Gonzalez, E.G., Keim, H., Alonso, J.A., Michelsen, C.B. : Somatosensory Evoked Potentials as an Intraoperative Measure of Lumbar Nerve Root Decompression. Arch Phys Med Rehabil, 67:618, 1986. Alonso, J.A., Coté, L.: Biology of Aging in Humans. In: Downey, J.A., Myers, S.J., Gonzalez, E.G., Lieberman, J.S. (eds): Physiological Basis of Rehabilitation Medicine. Stoneham Butterworth-Heinemann, 689-704, 1994.